There's no time for an explanation. Hop in the car with a complete stranger and have him gun it. You're in too much pain for anything else as the melancholy of it all comes crashing down on your heads, like a tarp thrown suddenly over the world. Not a lot seems clear at the outsight of this venture other than the beginning of the end is settings in, as both of your eyes droop with the need for sleep. The gas in the car is only going to last for so long and inevitably, it seems the car will come to a stop at some point. In the meantime, the only question is how much you want to confide in your newfound partner, and whether you will survive the upcoming night. 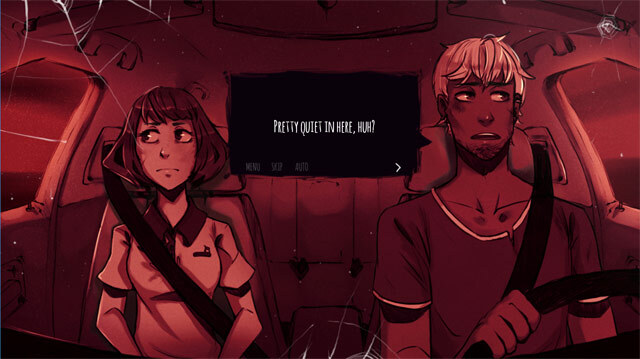 The game is told in visual novel format, with the occasional change in illustrations showing the two characters as they interact. The art strikes a poignant and ever-present reminder of the hopelessness of the situation, contrasted with the dying warmth of the sunset. Lox Rain does an excellent job of setting the mood with the colors streaked across the sky and the emotions of the characters are written all over their faces...yet as you play in first person, you still control exactly what you feel like showing or concealing to yourself. A key element of visual novels in general is perspective, and this game does a good job of it, showing your character's inner, unspoken thoughts, in addition to the dialogue. The most unique aspect of The Shadows That Run Alongside Our Car, though, is the ability to play through as both characters. By allowing you to interact intimately with the thoughts of the characters, you can appreciate more fully the story and the predicament that the pair is in. You are asked to choose which character you want at the beginning of the game, of course, but nothing stops you from exploring the other side of the car in subsequent playthroughs. It's not exclusively through the visual sense, though, as a catchy yet somber tunes blares through most of the adventure. Contrasted against the faint sound coming from the gravel of the road, it seems to fit the post-apocalyptic scenery perfectly. Gameplay is similar to other visual novel titles in Ren'py. Press [Space] to advance the text, and at times you're prompted to make a choice, click on one of them with the mouse. Some other settings can be changed in the options menu. 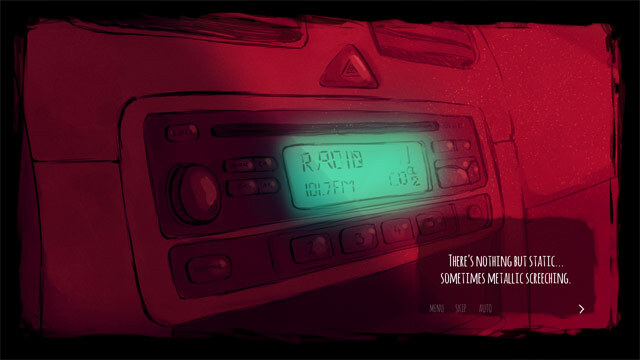 The Shadows That Run Alongside Our Car features 5 separate endings - see if you can discover them all!